Albeit a little belatedly, I got wind of a very interesting debate spurred by Alan Lepofsky of Constellation Research, where he compares email to social messaging as a notifications and communication system. We’ve spoken to Alan before, and were privileged to be featured in his recent report – Getting Work Done With Social Task Management (a must read for forward thinking managers). Alan is one of the thought leaders in collaboration and social business and we have high regard for his depth of knowledge. Alan 1. Email feels mandatory where social networks are voluntary. BS! As companies adopt internal social networks the pressure to “check your stream” is going to be just the same as “check your inbox”. 1. You keep track of only internal activity on your work related social walls. 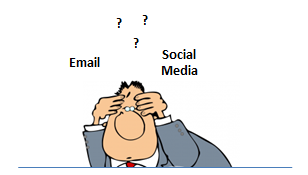 Email on the other hand attracts every imaginable communication and notification from the outside world. Important internal communications get lost in this sea all the time. Although modern business social networks do let users monitor some external information, this information still comes through filters. Email, in contrast is the playground of every scammer and marketer in the world. 2. Email is siloed. Every email exchange exists in a block, available to only the sender and receiver, which gets buried soon after it was created. The business knowledge captured in an email is forever locked away and can almost never be used to benefit the business in the long term. On the other hand, social tools are open and encourage even people not in the original conversation to participate, and transform that information into new unexpected forms that will benefit the organization. 3. Email is inefficient, in that every exchange creates a new block of information. Information is therefore duplicated exponentially, as it is sent back and forth time and again. Social tools on the other hand pull people to central copies of information. 4. Social tools have a superior structure. The overall information design of social tools with activity streams, comment threads, profiles, seems to be vastly more user friendly than email, as amply proved by the success of services like tools like Facebook. Social tools bring further benefits like linking you right back to the object notifications relate to – for example in HyperOffice, you can access a task right from the task notification. Alan 2. You can check social networks when it’s convenient as opposed to feeling like your inbox is waiting for you 24*7. BS! As companies adopt social networking people’s expectations will be that you’re always monitoring the stream. Agreed. But monitoring a social stream is easier since it mostly relates to internal activity or highly filtered information. Alan 3. Any reduction in the number of emails is a good thing. OMG I hate this one. Now instead of checking my inbox I have to check Twitter, Facebook, Google+, Yammer, LinkedIn, etc. Uggghhhh. Adoption definitely suffers when people are expected to manage work through multiple software. 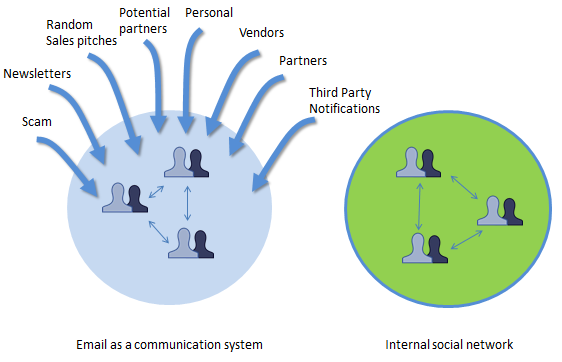 However, when we refer to social business tools, we are talking about a single internal social network. Keeping on top of multiple networks like Facebook, Twitter, and Linkedin is indeed becoming important for modern businesses, but that is more in the domain of social media marketing and social CRM. 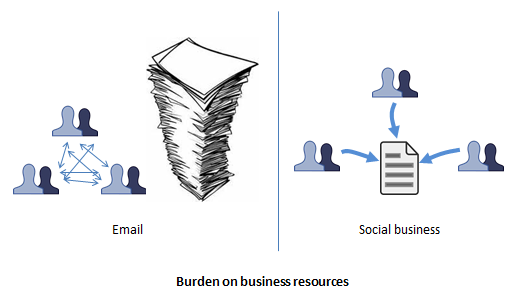 Social business software relates to working together with colleagues and partners. So even if you mainly use email, you still have to use Facebook, Twitter, Google+ etc. for the above purposes. My arguments relate to the superiority of using a private social network over email for internal communications and monitoring system. However, to interact with the outer world, email still seems to be the best tool, simply because different email systems can interact with each other through standard protocols. Social software is not yet at that level of maturity. We fully recognize this reality, for which reason email remains an important cornerstone of our HyperOffice suite.